When I can start building the Squidport? For many of us, when the Springfield Squidport was added, we were set to build it right away. New players to the game are not this fortunate. Like with all other content, you need to reach a certain level to access it. To start the construction on the boardwalk you need to be at least Level 15. Once you get going, the development of Squidport will coincide with your level if you keep expanding it. 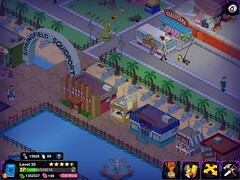 This can be difficult, as there will be points in the game where you will have to decide between spending on money on new buildings for Springfield, or new buildings for the Squidport. Photo Challenge: Does anybody walk or run anymore? In the first photo challenge I wanted to see if someone could get everyone who plays a musical instrument together in one screenshot. The challenge was completed by Raventhief, who even managed to add Sherri & Terri into the mix as well. For this challenge I’d like to see if you can get a good screenshot of the citizens of Springfield get around without walking or running. Below are a list of some characters and tasks where they either use bicycles, a Segway, or even a model train. Photos can be submitted via a comment, or preferably posted to our Flickr pool. Lets see what kind of fun photos can be taken using this theme. Players who complete this challenge will have their photos posted in a special post showcasing the results.